Posted on November 17th, 2018 in At large. At 0700 wind was still lightly from the SW, but the forecast has it going around to the SE by midday. The MHL buoy was showing 1.2 metres at 8 seconds from 155 degrees (SE) and the WRL snap from first light showed it was probably in the knee to waist-ish range on sets at more exposed locations. Tide is dropping to a low at about 1020. By the time it’s back to the 1.48m high at 1630, the wind should be chewing things up. Water’s around 20C. Waves have come up a touch today in SoCal, so I might go for a surf hunt this afternoon. Hoping the swell direction is favourable to Santa Barbara (don’t want to drive an hour south to the crowded, sideshore conditions in Ventura). A trough of low pressure over northern parts of the coast will move slowly north today as a high pressure system in the Bight moves east and strengthens a ridge along the New South Wales coast. Freshening south to southeasterly winds are expected to extend along the Waters during this afternoon and evening. The high centre moves into the Tasman Sea on Monday with winds tending east to northeasterly. Winds freshen and tend north to northeasterly Tuesday ahead of the next change expected along southern parts of the coast during Wednesday. Southeasterly about 10 knots increasing to 15 to 20 knots in the middle of the day. Partly cloudy. 60% chance of showers. The chance of a thunderstorm from late this morning until early evening. Southeasterly 10 to 15 knots decreasing to about 10 knots in the evening. East to northeasterly about 10 knots increasing to 10 to 15 knots during the morning. Posted on November 16th, 2018 in At large. Santa Barbara’s still languishing in the ankle high range, but down south at Trestles it looks textured but fun – lucky pups. Posted on November 15th, 2018 in Goat's Forecast. Thursday: ditto at dead South places only, might be small Ok if forecast offshore comes good. Forecast issued at 4:20 pm EDT on Thursday 15 November 2018. Cloudy. Medium (60%) chance of showers. Winds southerly 20 to 30 km/h decreasing to 15 to 20 km/h in the late evening. Cloudy. Slight (30%) chance of a shower in the early morning. Winds south to southwesterly 15 to 20 km/h becoming light early in the morning. Partly cloudy. High (70%) chance of showers, most likely in the afternoon. Light winds becoming south to southeasterly 20 to 30 km/h in the morning. Partly cloudy. Slight (20%) chance of a shower. Light winds becoming southeasterly 15 to 20 km/h during the day then becoming light during the afternoon. Partly cloudy. Light winds becoming east to northeasterly 15 to 25 km/h during the day then becoming light during the evening. Mostly sunny. Light winds becoming northeasterly 15 to 25 km/h during the day. Cloudy. High (70%) chance of showers. Winds northerly 15 to 25 km/h. Posted on November 14th, 2018 in At large. Beaches with NE exposure should be picking up a little something this morning. The MHL buoy was showing a couple of metres of 8-sec windswell from 134-136 degrees, plus some chop from the north. Wind at 0645 was 5 kts from the NNE. The WRL cam showed a fair amount of texture on the surface and the forecast is calling for 15-20kts North wind later – with swell heights bumping up too. Water is on the 20C mark. Next tide is a 1.57m high around 1240. Weather is set to be cloudy (showers early, thunderstorm possiblle later) and going to a high of 24. From the shape of the forecasts, it looks as though this morning could be about as good as it gets over the rest of the week. General trend is for short period and small windswell – with increasing winds. The fires continue to produce smoky skies in Santa Barbara. Only swell is a south which gets blocked in the Santa Barbara area by the Channel Islands (yep, where Al Merrick got the brand name). It looks as though the further south you go, the better the waves. Cardiff (near San Diego) was looking super fun – offshore and chest plus on the peeling sets. Unfortunately for me, it’s 5 hours of heavy traffic away, so oh well. Have yourself a top old Wednesday everyone! A high pressure system over the Tasman Sea extends a ridge towards the northern New South Wales coast and is directing north to northeasterly winds along most of the coast. The next trough and associated southerly change is forecast to reach the far southern coast this evening, before moving over central waters during Thursday and northern waters during Friday. 1.5 to 2 metres, decreasing to 1 to 1.5 metres around midday, then decreasing to 1 metre during the afternoon. Northeasterly around 1 metre, increasing to 1.5 metres around midday. Cloudy. The chance of a thunderstorm late this afternoon and evening. Northerly 15 to 20 knots shifting southerly during the morning. Northeasterly 1.5 metres, tending easterly 1 to 1.5 metres during the morning. Southerly 15 to 20 knots turning east to southeasterly below 10 knots during the afternoon. Posted on November 12th, 2018 in At large. A light SE breeze when I checked conditions in Sydney (from the other side of the planet) around 1020. From the look of the WRL cam pic at south Narrabeen, the sub 1 metre 10-11 sec SSE bump wasn’t producing much of interest on a sunny Sydney morning. Ocean temp is around 20C and you’re going to a high of 25. No postcard from Cali this morning, but I can report that skies are smoky from the bad fires north and south of us. No decent swell in the outlook here until maybe late next week… so bah on that. Seems that California – or at least the bit I’m in – isn’t going to have much of an autumn where surf’s concerned. Posted on November 10th, 2018 in At large. But, now the wind has started up and will acording to The Bureau freshen from the S turning SE this morning. You might find a protected corner with small waves before high tide at 10.44. Don’t forget Remembrance Day – Armistice day – tomorrow … Remember the Diggers on the 100th anniversary of the end of WW1. I think the only surf report from WW1. Bureau’s call, there’s no relief in prospect for a few days yet. The models show an iflux of strong NE wind midweek, but though the waves should bump up, it’ll be low quality short period windswell – and the biggest stuff is likely to be where the onshores are strongest. Meanwhile, we too are waiting for something to improve in California. It’s really small up and down the coast, and where I am, it’s flat. Blasting wind blowing up a fire that would soon close the main north south freeway (101) in southern California. A high pressure system over the Tasman Sea extends a ridge towards the northern New South Wales coast. A trough will bring a weak southerly change to southern and central parts of the coast today, before stalling and dissipating on the Macquarie coast. The Tasman high is then expected to remain dominant for several days, with the next trough forecast to arrive during the second half of the week. North to northwesterly about 10 knots tending south to southeasterly 10 to 15 knots in the middle of the day then becoming east to southeasterly below 10 knots in the evening. Below 1 metre, increasing to 1 to 1.5 metres around midday. The chance of a thunderstorm offshore this morning. Mostly sunny afternoon. South to southwesterly below 10 knots becoming southeasterly in the middle of the day then tending east to northeasterly 10 to 15 knots in the evening. Northeasterly 10 to 15 knots increasing to 15 to 20 knots during the day. Posted on November 8th, 2018 in Goat's Forecast. What is that cold wind all about!!? It brought up some very windy surf at places open the dead South but the wind and the surf are expected to ease off tomorrow. The surf outlook is for continued easing off through to Tuesday and Wednesday when there should be some Nor East windswell to play with. 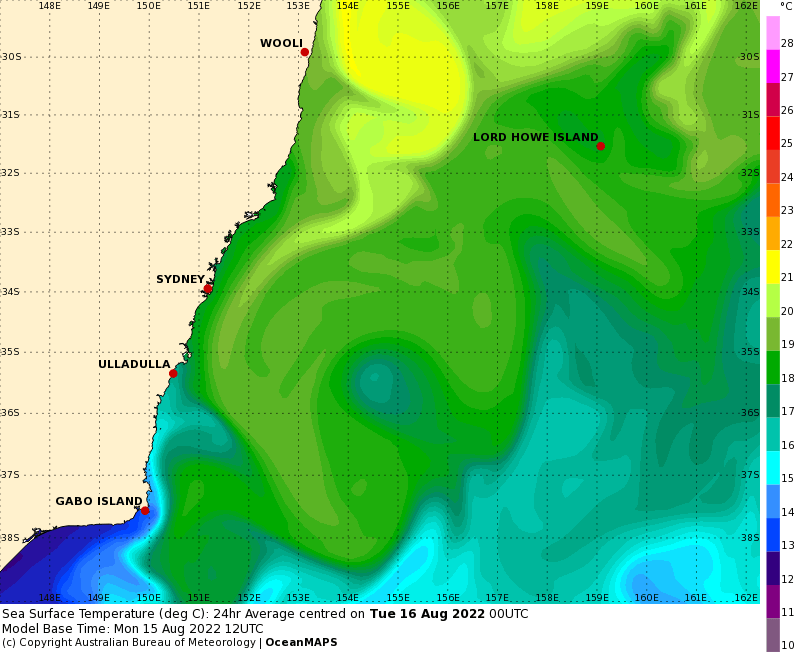 Thursday: 1-2 metre range East South East then starting to come up later from the South. Remember the Diggers on the Western Front on the 100th anniversary of the end of World War 1, Sunday. Mostly clear. Winds southeasterly 15 to 20 km/h becoming light in the evening. Partly cloudy. Light winds becoming northerly 15 to 20 km/h in the middle of the day then tending northeasterly 20 to 30 km/h in the early afternoon. Mostly sunny. Light winds becoming southerly 15 to 20 km/h in the morning then turning east to southeasterly in the middle of the day. Mostly sunny. Light winds becoming easterly 15 to 20 km/h during the afternoon then becoming light during the evening. Partly cloudy. Winds northerly 15 to 20 km/h turning northeasterly 20 to 30 km/h during the morning. Posted on November 7th, 2018 in At large. The MHL buoy was showing a metre of bump from the south at about 7 seconds at 0600. Wind is light SSW and the predicted rain doesn’t seem to have turned up yet. Water’s 21C according to Beachwatch and tide was a deep 1.7 m at 0800. Nothing happening in my part of California, but there were waves of a sort at magnet spots like Ventura and Trestles, which is above expectation. Here are a couple snaps from surfline’s cams. A high pressure system near New Zealand is directing generally northerly winds along the New South Wales coast, with a cold front and associated southerly change extending north today. The front is forecast to reach the northern border early Thursday. Behind this, a new high pressure system is expected to approach from the west, and should become the dominant weather feature for several days thereafter. Northwest to northeasterly 10 to 15 knots tending southerly 20 to 25 knots during the morning. Around 1 metre, increasing to 1 to 1.5 metres around midday. Cloudy. Near 100% chance of rain. The chance of a thunderstorm in the morning and early afternoon. Southerly 20 to 25 knots, reaching up to 30 knots during the morning. Winds turning southeasterly 10 to 15 knots in the evening. 2 to 3 metres, decreasing to 1.5 to 2 metres during the afternoon. Variable about 10 knots becoming northeasterly 10 to 15 knots during the afternoon. Southerly 1.5 to 2 metres, decreasing to around 1 metre during the afternoon. Posted on November 6th, 2018 in At large. Hot and humid and cloudy day ahead …33 max but feels very warm already at only 24. No wind so the surface is glassy.. but the surf is small to flat. Might get a little improvement as the tide runs out.